RUGBY league icon Norm Provan is recovering in a private hospital on the Sunshine Coast after a recent spat with a concrete path. The giant of the game - both in stature and in reputation - passed out while walking his dog late one afternoon three weeks ago, fell and struck his head on the concrete path. As a result he has suffered some minor mobility issues but is undergoing physiotherapy and is on the mend. However he is expected to remain in hospital in the short term, where he describes the accommodation, attention and care as "absolutely first class". Provan, who is 81, is regarded as one of the greatest rugby league players and coaches of all time, and an ornament to the game on and off the field. He is a stalwart of the Men of League organisation and patron of the Sunshine Coast committee. He played in 10 of the record 11 successive premierships won by the mighty St George Dragons from 1956 to 1966, and was captain-coach in four. 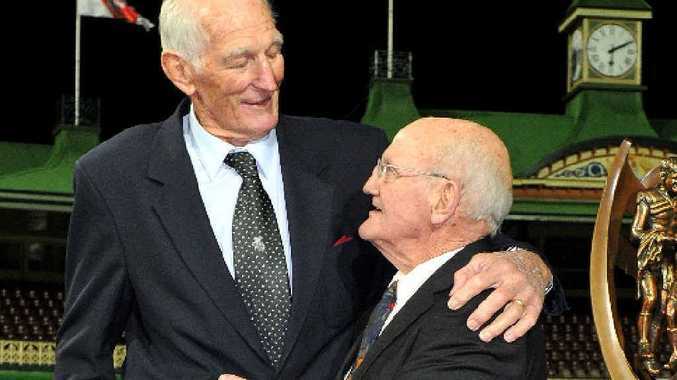 The fall prevented Provan from attending the memorial for legendary team-mate Reg Gasnier at last weekend's Dragons home match. His record of 256 games for the Red V was surpassed two years ago by Ben Hornby. The big second-rower also played 14 Tests for Australia and 19 games for NSW, and in 2008 was named in the Australian team of the century. But in more recent times Provan has become better known as the Gladiator, with the famous post-grand final, mud-caked image of him embracing Western Suburbs captain Arthur Summons immortalised atop the NRL premiership trophy. Provan and his wife Lindy have called the Sunshine Coast home for the past 25 years and recently moved from their property at Mooloolah to Golden Beach, where the accident occurred. Sadly his 12-year-old dog Bugsy, whom he was walking at the time, has since died. While appreciating that people may be concerned for his health, the rugby league great has asked that his privacy be respected. "I am okay, and I thank all those wonderful folk who have shown their concern for me," he said. "But for the sake of the hospital and the busy staff here who do such a wonderful job, I would be grateful if they are not distracted by phone calls and visitors."